One of the most amazing design aspects of the iPhone X is its size. It might not get to you the first time you see it, but in fact, the iPhone X is significantly smaller than the iPhone 7 Plus. Now listen to this: the iPhone X comes with a 5.8-inch display and the iPhone 7 Plus features a smaller 5.5-inch one. So not just that the iPhone X is much smaller in size, it also comes with a larger screen. The reason for that is obviously the edge-to-edge design. Apple completely removed the top and bottom bezels. There is a 4mm glass that wrapped around the phone. So it's not totally bezel-less phone, but after you see the photo below, I don't think you will complain about that. 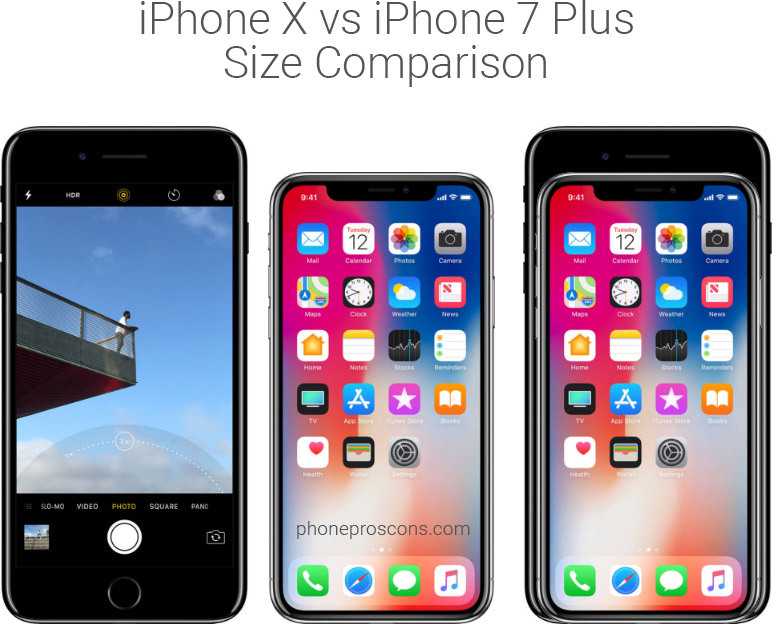 He is an iPhone X vs iPhone 7 Plus size comparison image. I think this image clearly shows one of the main benefits of having a full screen phone. most of the front space is used for the display itself and not for the bezels. Some people even like not having a bezel-less phone because the sizes are used for holding the phone and that can trigger unintended touch events (e.g. launching an app unintentionally). Just look how big the iPhone 7 Plus is compared to the iPhone X. I think once you see that comparison you understand why Apple went for this premium design. I don't know a person that would prefer having a larger device. It's not that you get a smaller screen, the screen is even bigger than the larger phone. This is why the latest trend in mobile phones is bezel-less design. Getting rid of those ugly and unnecessary bezels and making phablets more compact and more comfortable to use. The only downside to this in my opinion is when playing games. When I play games in landscape orientation, it doesn't feel comfortable to play as your hands cover part of the edges of the screen where the content is displayed. With phones like the iPhone 7 Plus that have bezels, you hands are laid on those bezels and the content is not obscured by them. I will be very interested to hear users' opinions about that design once they try out a few games. The good news is that because it has 4mm edges, it might not be that bad compared to other phones that have thinner edges - we just need to wait and see.